In this image, Peter stands with his back to the viewer. His outstretched arm reaches toward the beggar in the lower left. The scene is witnessed by John, at the far right, and others who have come to the temple. Dürer is masterful at loading one gesture with multiple meanings. Peter’s reaching for the cripple could also be read as Peter disputing with the man standing behind the beggar. On more careful examination, we can see that both men are gesturing with their left arms and hands. Their debate contrasts an obedience to the law and a faith that depends on the grace of the gospel. Lucas Cranach the Elder’s 1529/30 woodcut Law and Grace. The Law versus the Gospel was a popular theme in 16th-century German art. 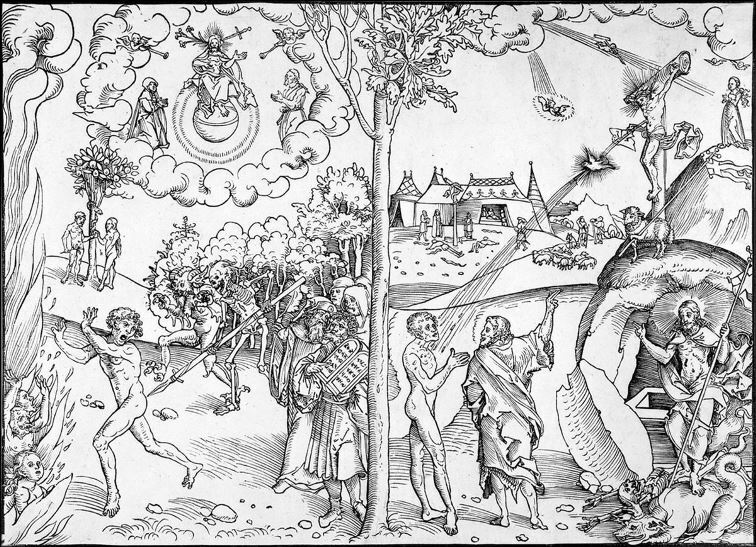 The most famous examples of this are images by Lucas Cranach the Elder depicting, in graphic terms, sinners being either chased naked into hell by death and the devil or being washed in a fountain of blood that spurts from the body of Christ hanging on the cross. While such terrifying images must have had a profound impact on the imaginations of many contemporary believers, their lack of subtlety might disaffect other viewers. Dürer considered art to be an intellectual activity and was a friend of the humanist scholar Erasmus of Rotterdam. Would Erasmus have been moved by Cranach’s over-the-top print? To address a more sophisticated audience, Dürer developed a subtler theological argument. The man with whom Peter argues holds a bag of money, which we can presume he means to give as an act of charity. In this way, he is obedient to the law. In fact, the crippled man sits by the temple gate because the law required the giving of alms to the poor. So, the man with bag of money can be seen as someone attempting to keep the law the best that he can. Nevertheless, without faith in Christ, his face is cast in shadow. Peter stands in the light. His gift to the cripple is faith that will not only heal his body but also bring him spiritual salvation. 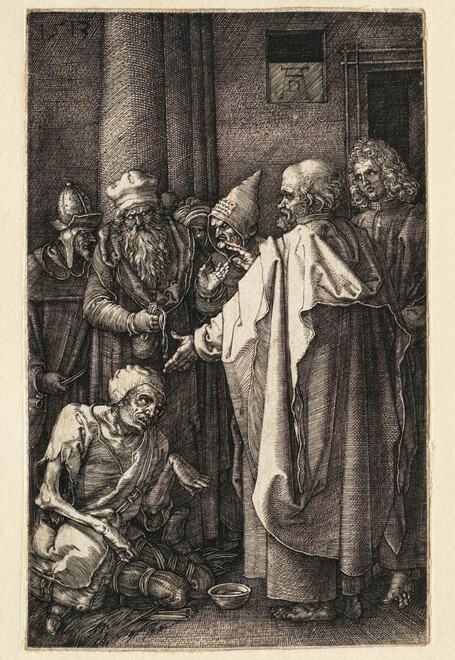 The proposition that salvation could be gained through the giving of money was a current issue in Dürer’s time. Numerous reformers, including both Erasmus and Martin Luther, were critical of the sale of indulgences by the church in Rome. Therefore, Peter’s message that salvation is the free gift of God to those who put their faith in Christ was a highly charged proposition. If Dürer’s print addressed contemporary church practices, he was clever in using Peter as his messenger. The papacy in Rome regarded Peter as the first pope and some of the money being collected in Germany was for the purposes of building a church in Rome dedicated to Saint Peter. The fact that it was Peter delivering the message of free grace would have made this rebuke of the papacy all the more direct. Dürer’s exhortation to the power of faith still resonates today. Albrecht Dürer: Peter and John at the Gate of the Temple, after 1513, engraving on paper: 4 1/2 x 2 7/8 in. (11.5 x 7.3 cm). William J. Collins Collection, Sterling and Francine Clark Institute of Art, Williamstown, MA, USA. Albrecht Dürer was born in Nuremberg, Germany, in 1471. His family came from Hungary, Germanizing the family name to Thürer or Dürer when they settled in Nuremberg soon after the middle of the 15th century. His father, also called Albrecht, was a goldsmith. His parents had eighteen children, of whom Albrecht was the second. Albrecht's younger brother, Hans Dürer, became a well-known artist as well in the sixteenth century. Albrecht Dürer’s work includes altarpieces, portraits and self-portraits, drawings, engravings, and woodcuts. In 1494 he traveled to Italy, where he remained until 1495. The trip had a strong effect on him; echoes of Italian art are apparent in most of his drawings, paintings, and graphics of the following decade. Italian influences were slower to take hold in his graphics than in his drawings and paintings. He died in 1528. His works stand with Leonardo da Vinci, Raphael and Michelangelo as the highest artistic achievements of the Renaissance. To read a more extensive biography, go to http://www-groups.dcs.st-and.ac.uk/~history/Biographies/Durer.html. James Romaine is the president and co-founder of the Association of Scholars of Christianity in the History of Art (ASCHA). Dr. Romaine’s video essays on Albrecht Dürer will be posted for Holy Week (March 20-27) and can be viewed on YouTube at Seeing Art History, see https://www.youtube.com/channel/UCGInLlFDxg-GgCEUQkjKwng.